Quick! Somebody get Maggie Srivastav The Smelling Salts! HONOLULU (AP) — The actor best known for playing the TV character Gomer Pyle in the 1960s has married his male partner of 38 years. Hawaii News Now (http://bit.ly/14tFM3U) reports Jim Nabors and his partner, Stan Cadwallader, traveled from their Honolulu home to Seattle to be married Jan. 15. The 82-year-old Nabors says you’ve got to solidify something when you’ve been together as long as they have. Nabors says he’s been open about his homosexuality to co-workers and friends but never acknowledged it to the media before. Nabors played Gomer Pyle in “The Andy Griffith Show” and “Gomer Pyle, U.S.M.C.” television shows. O Lucky Jim, I remember him! James Thurston “Jim” Nabors (born June 12, 1930) is an American actor and singer. Born and raised in Sylacauga, Alabama, Nabors moved to Southern California because of his asthma. While working at a Santa Monica nightclub, The Horn, he was discovered by Andy Griffith and later joined The Andy Griffith Show, playing Gomer Pyle, a gas station attendant whom some described as dim-witted, though Nabors himself said that the Gomer character was not so much dim-witted as just wanting to see the good in people. The character proved popular, and Nabors was given his own spin-off show, Gomer Pyle, U.S.M.C. Though best known for his portrayal of Gomer Pyle, Nabors became a popular guest on variety shows in the 1960s and 1970s (including two specials of his own in 1969 and 1974) after revealing a rich baritone voice. He subsequently recorded numerous albums and singles, most of them containing romantic ballads. Nabors is also well known for singing “Back Home Again in Indiana,” prior to the start of the Indianapolis 500, held annually over the Memorial Day Weekend. An urban legend maintains that Nabors married Rock Hudson in the 1970s. In fact, the two were never more than friends. According to Hudson, the legend originated with a group of “middle-aged homosexuals who live in Huntington Beach” who sent out joke invitations for their annual get-together. 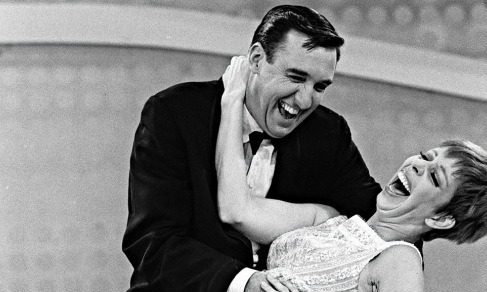 One year, the group invited its members to witness “the marriage of Rock Hudson and Jim Nabors,” at which Hudson would take the surname of Nabors’ most famous character, Gomer Pyle, becoming “Rock Pyle.” Those who failed to get the joke spread the rumor. At the time Nabors was dating his boyfriend, Stan, whom he eventually married; Hudson was also long suspected of being a homosexual, and because of the fear that one or both of them might be outed, Nabors and Hudson never spoke to each other again. Rock of course HAD been “gay married’ before. The old-fashioned bearded kind.